The word kitchen is almost synonymous with the word home because the kitchen is where food is prepared, and often where the family gathers for meals. If the rich aroma of freshly brewed coffee conjures up visions of your kitchen, then you might be interested in coffee themed kitchen décor. Themed kitchen décor can range from cups or plates that are decorated to fit a theme, right on up through curtains, tablecloths and window curtains. You can use your theme as an accent, or you can focus deeply on it, letting it bubble up all over your kitchen. If your theme is coffee, then you will want to start with the marvelous aroma of freshly ground and brewed coffee, and to emphasize it with cups, plates, witty wall hangings and even your tablecloth and curtains. Coffee isn’t just a drink. It is also a plant that provides a vital part of an economy in the areas where it is grown, so you can branch out from steaming cups and mounds of coffee beans to include travel photos of coffee plantations. But if you are a true fan of the beverage brewed from the rich, brown beans, then you will love the many options you have to celebrate that revivifying drink. You’ll, no doubt, enjoy your coffee hot or cold. Perhaps you take it black – recommended by dietitians for folks who want to lose weight, or perhaps you like it sweetened and/or well laded with milk or cream. Perhaps you enjoy your brew spiced with cinnamon or flavored with hazelnut or fruit. The variety of flavors that cater to discerning palates is nearly infinite. Coffee lovers are so spoiled for choice, it is no wonder you might want to decorate your kitchen with representations of this marvelous drink. The variety in which it can be enjoyed is nearly endless and so are the choices for kitchen decorations. From comfy cushions for your bar stools to witty wall hangings, and all in between, you can have your coffee – just the way you like it – and enjoy references to it as you go about meal preparations in the room that has long been considered the heart of the house. So let’s have a nice cup, and settle in to look at some coffee themed kitchen decorations. Celebrate your favorite drink with a themed metal wall decoration from Andover Mills that features a steaming coffee cup sitting on a saucer. The cup and saucer are splashed with refreshing impressionistic artwork, which includes a red tree against a pale blue background. 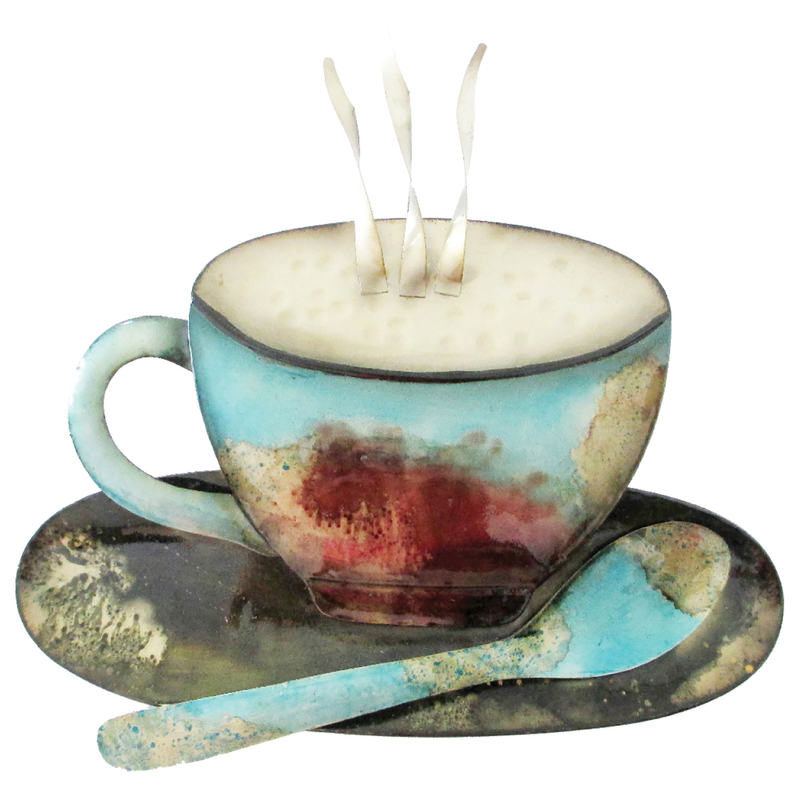 The steam rising off the cup is represented by three metal spirals rising up from the cup as if it were piping hot. Another offering from Andover Mills is a sparkling coffee cup and saucer featuring the word “café” spelled out in sparkling stones on the side of the cup. No steam on this one – just a stylized sculpture perfect for hanging in your breakfast nook. These twinkling gems and a cup of your favorite brew should be a boost for your perfect morning. You are in the kitchen, so it must be coffee time. Celebrate it with an “It’s Coffee Time” wall hanging from Adeco Trading. The sign is made to resemble worn boards, and is emblazoned with the words “It’s coffee time.” The background color is raw umber, the word “coffee” is in sepia and the other letters are white creating an attractive understatement. Tasteful sepia tone wall hanging from Adeco Trading proclaims, “Drink Coffee Do Stupid Things Faster with More Energy.” This crazy saying is bound to provoke some conversation in the kitchen while you sip your favorite beverage, such as “What stupid things?” “Does faster mean reckless or getting dull chores over fast?” Either way, it is a cute sign, perfect for dressing up a blank wall. While just about anytime is coffee time – unless you are an insomniac on your way to bed – sometimes you need to know what time it really is. A coffee time clock from Westclox will keep you clued in as to the time of day, with a charming wall clock shaped like a cup of coffee with steam rising from the cup. Floors should not be neglected when decorating. The Ottoman Siesta Collection includes a fun runner rug featuring Dad in the Kitchen. An Italian-style chef twirls a thin mustache while presiding over a large, steaming pot. However, it is just possible that his beverage isn’t coffee – judging from the bottles flanking the large pot. Regardless, this soft rug can save your feet and cut down on wear in high traffic areas. This eye-catching three-D metal sculpture brings to mind a skilled waitress balancing a stack of steaming coffee cups. The sculpture depicts a slightly staggering stack of cups and saucers, the top one of which has curls of steam wafting up from it. It’s so detailed you can nearly smell the aroma of rich, well-brewed coffee beans, cream and sugar. This fun enamel on the tin sign, made in Germany, features a stack of graduated cups. The bottom-most and largest cup is labeled “Café,” the next up is a checkerboard design sporting the word “Cappuccino”, and the topmost, smallest cup is lettered with the word “Expresso.” The bright sign is perfect for enlivening a dark corner at home or in a breakfast restaurant. This charming painting depicts a stack of mugs teetering one atop the other, with the legend “Café Espresso” lettered across the bottom. The five-inch by eleven-inch size makes it perfect for that narrow space that just never seems to work with anything. Made of wood, from Little Store of Home Décor, it is easy to hang and sufficiently durable for a busy kitchen.